Now that summer is creeping upon us, it’s time to take extra precaution when being outdoors. Living in Florida, we tend to experience an insane amount of heat, humidity, and the worst – sunburn. My fiancé thinks that I’m crazy, but I keep my go-to jar of coconut oil on me at all times in order to help with a lot of mishaps that tend to occur during these hot months. Sunburn – Since coconut oil has anti-inflammatory properties, I always lather this on generously if I get sunburned from being out on the beach too long or even doing yard work. You can re-apply coconut oil to your sunburn as many times as needed and I’ll do this approximately every hour if the sunburn is really bad. For added relief, try making my Aloe Vera & Coconut Oil Gel, which contains a great cooling sensation if kept in the refrigerator. Insect Repellant – Whether you’re camping, having a barbeque in your backyard, or walking around at night, mosquitoes seem to be extra prevalent during the summer heat. I personally don’t like having to use a bunch of chemicals on my body to repeal bugs, so I now make my own insect repellant! This concoction contains citronella oil, lavender oil, Kelapo coconut oil, and some water in a spray bottle. Good-bye bug bites, hello sweet smelling insect repellant! Deodorant – Summer heat means sweat and stink! I have had the hardest time trying to find a deodorant that works for me and believe it or not, the deodorants that contain aluminum have been linked to both breast cancer and Alzheimer’s Disease. To help solve this issue, I took it upon myself to do my research on creating my own. Try this DIY Deodorant Stick at home for yourself – you won’t be disappointed. Hair Serum – Our heat and humidity can get ridiculous in Florida, especially for me with my wavy hair. I have spent so much money on anti-frizz products and salon quality shampoos, only to find that not much of that has worked for me. After hearing about how coconut oil can help tame any luscious locks, I put this to the test myself. Sure enough, applying a dab of coconut oil to my blow-dried hair has helped my frizz and fly-aways! Need more hair tips? 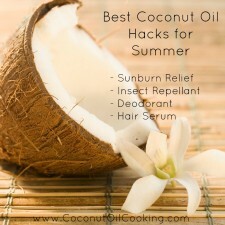 Be sure to visit this blog with DIY Coconut Oil Hair Uses. Do you have a summertime coconut oil hack for us? Leave your comments below! I loved your article. I’m a huge fan of Kelapo’s coconut oil and have written for them in the past. Thanks for all the wonderful tips. Thank you so much for this 🙂 Hope that you’re doing well!